It’s a time-honored tradition that touring musicians will mangle the pronunciation of “Des Moines.” Those Ses throw everyone off. 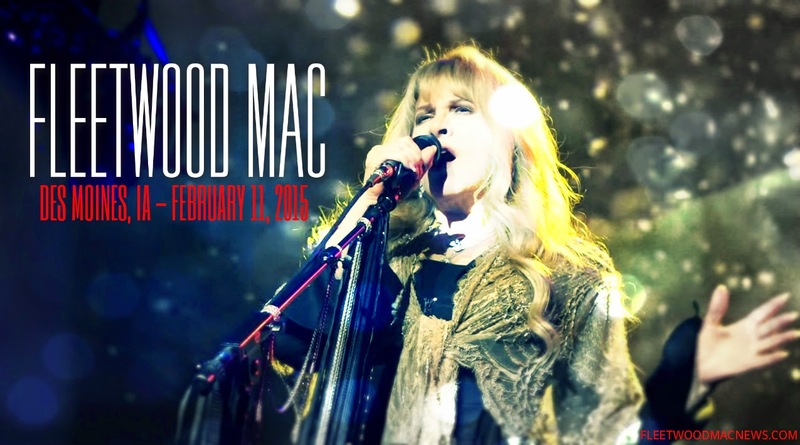 Wednesday night at Wells Fargo Arena it was Fleetwood Mac’s Christine McVie who got tripped up. To be fair, she had a good excuse. “It’s been many a year since I’ve been in the city,” McVie said after making a small error she was probably unaware of. While Fleetwood Mac last played Des Moines less than two years ago, McVie hasn’t been a regular part of the band in 17 years. The crowd got a heaping helping of McVie during the show. After starting the show with the group effort “The Chain,” McVie launched into “You Make Loving Fun,” a song long absent from Fleetwood Mac sets. The newest material came from 1987’s “Tango in the Night,” with “Everywhere,” “Big Love” and “Seven Wonders” getting play. “Seven Wonders” got some added attention last year in the finale of the series “American Horror Story” and Nicks gave the show a shout out after finishing. Well, she pronounced it right. And she followed that with “Landslide,” accompanied by only Buckingham. From there Nicks left the spotlight, with Buckingham remaining to start “Never Going Back Again” solo, with Nicks eventually rejoining him on backing vocals. I can’t compare the show to 2013’s performance, but the crowd at Wells Fargo Arena was enraptured. The cheers after certain songs probably would have gone on indefinitely if Fleetwood Mac didn’t start another song. It was largely a mellow night of music, with Buckingham occasionally living things up a bit with songs like “I Know I’m Not Wrong” and “Tusk.” Some of the highs aren’t as high as they were 40 years ago, but the voices of McVie, Nicks and Buckingham have held up surprisingly well over the years. There were a few rambling stories told by Nicks and Buckingham, which chances are doubled as resting periods for the other members, but the audience never seemed to get restless. During “Gypsy,” the band gathered around Nicks, including drummer Mick Fleetwood, who moved up to a smaller drum set. At the song’s end she gave the crowd one of her signature twirls, showing off her signature layered look. From there Fleetwood returned to his main drum set and McVie, Nicks and Buckingham belted out “Little Lies,” giving the show another upswing of energy. When introducing the band and backing musicians during the first encore, Fleetwood singled out McVie with “Our songbird has returned!” So it seems fitting that the show would close out with McVie taking the stage solo to perform “Songbird” before being joined by Buckingham. In my review of The Eagles I pointed out that I was never really a fan of the band, and despite the fact that it was a quality show they didn’t pull me into the fan category. Similarly, I didn’t grow up listening to Fleetwood Mac. During a rebellious teenager phase I even proclaimed to friends that I disliked the band. I was wrong, I’m pretty sure I’m a fan now. Wednesday’s show was the straw that broke the critic’s indifferent back. Despite almost all the songs being more than 30 years old, the show didn’t feel like a band that was just trotting out the old hits. McVie’s return last year seems to have re-energized the band. If this was Fleetwood Mac’s last Des Moines show, they went out on a high note, even the singers voices couldn’t hit all the high notes they used to. You are; in my 62 year old, Woodstock attended, musically inclined, not so "golden" years Opinion - a contradictory 'critic wanna be'. I appreciate your effort to do a thorough job on reporting the facts of the performance, but in one statement you say they sang good and another statement you say "they went out on a high note, even the singers voices couldn’t hit all the high notes they used to"!!!!! What the heck does THAT mean. Make up your mind. You are very good at presenting the facts, BUT your "opinions" haven't been presented well enough to be considered. Good job.....anyway. HUH? That's NOT what was written. It was this: "Some of the highs aren’t as high as they were 40 years ago, but the voices of McVie, Nicks and Buckingham have held up surprisingly well over the years." That sounds like a compliment to me, and the meaning isn't lost on me at all.